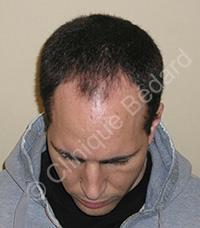 Hair transplantation is a capillary restoration technique that is applicable to both men and women. 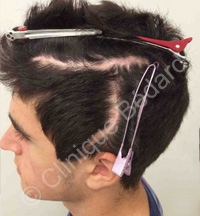 Hair transplantation is the approach of choice for the surgical correction of the problem of hair loss. In addition to correcting androgenic hair loss, it is used to adjust high frontal lines following a facelift to hide scars of the scalp and redefine missing eyebrows. 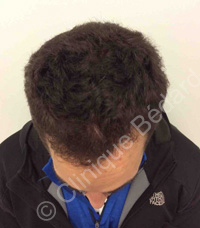 Individual hairs do not live in isolation, but in groupings of one to four, called « follicular units ». These units are invisible to the naked eye. However, with a microscope, it is possible to obtain the optimal use of all the harvested follicles. 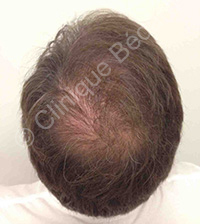 There is less chance of damaging the « follicular units », thus leading to natural results. 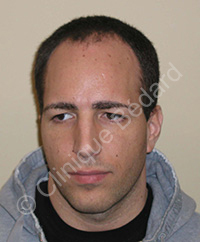 Hair transplantation involves minor surgery that produces durable results. The micrograft procedure does not add hair; it redistributes the hair that already exists on the crown. One or two visits are sufficient. The local anesthetic is administered using a spray gun rather than a needle. The hair transplant procedure leaves no visual evidence, except for small traces of irritated skin, which disappear in a few days. Bandages are not necessary. 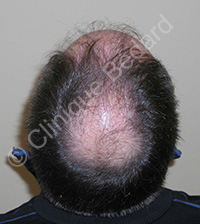 The receiving area can be covered by the patient’s own hair or, if needed, by a hat or hairpiece. 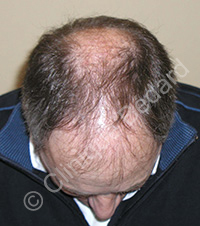 The remaining hair fully covers the donor area. Shampooing is possible as soon as the next day. * Note: photos are provided to illustrate the nature of the procedure and do not in any way constitute a guarantee of results. 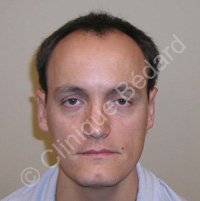 Hair transplantation is less expensive than the hairpiece which must be replaced regularly. 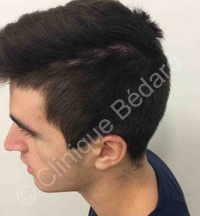 Hair transplantation is less expensive than conventional grafting, because the results are twice as good. 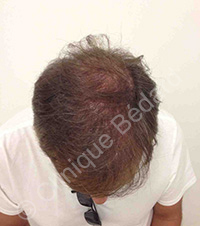 Hair transplantation is less expensive than Rogaine, with which results are temporary. More than 95% of transplanted hair grows again. 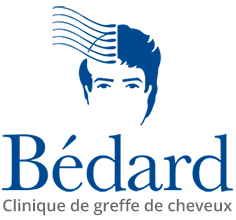 Following the hair transplant procedure, your hair has a natural appearance. There is no possibility of rejection because it is your own hair. 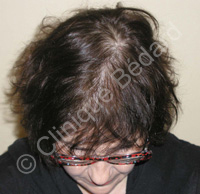 New hair starts to appear after the third month following the transplantation. Five months later, hair length has reached the combing stage. 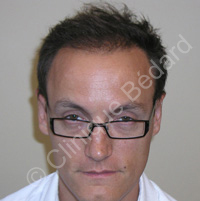 The results of a hair transplant are durable. The old method of hair grafting that produced a doll’s-hair look may also be corrected thanks to follicular micrografting. 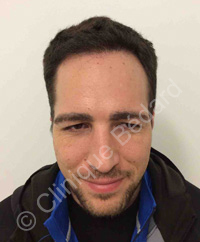 A safe and tested procedure, follicular micrografting is a real solution to hair loss. Results are widely known and proven. Hair is taken from the crown (the lower contour of the head), where hair growth continues even in the case of severe hair loss. 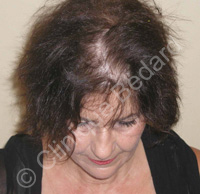 Results are durable as the grafted hair is not affected by hair loss.